When does personal transport tool become popular? It could be traced to the invention of the first intelligent and eco vehicle. At that time, no one could predict that the vehicle once designed for working and recreational use would make a splash in the transportation market. Since intelligent two wheel electric scooter unicycle being produced, discussions around it have never come to an end. But the hot discussions mean that it has successfully drawn enough attention. Could intelligent two-wheeled self-balancing scooters be used as transport tools? Are they safe? How are its eco and energy-saving functions? Will the eco commuting vehicle genuinely become a public transportation tool? 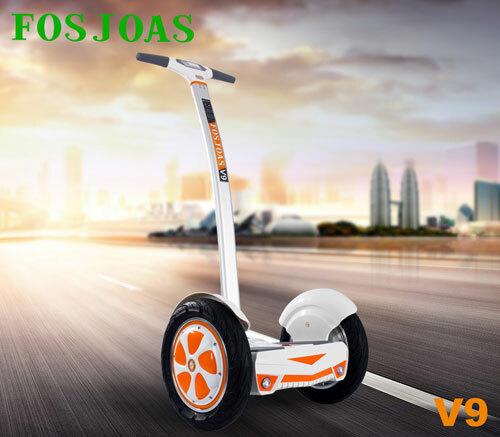 When the market originator Segway is mass produced, the cool shape has excited people's curiosity. People come to examine the new product. At that time, there are no such products in the market. However, judging from the current situation of Segway, it has many disadvantages, highly priced and lacking of agility. It does not deliver good user experience. It is until the birth of FOSJOAS that the market comes to yield unusually brilliant results. FOSJOAS products have brought into full play the eco and energy-saving technologies. From electric self-balancing unicycles to two-wheeled intelligent self-balancing scooters, Moben Global Inc. aims for the ultimate perfection. The market is a little patchy in terms of quality. Customers could not distinguish the good products from the bad. The market needs more professional brands like FOSJOAS. FOSJOAS products are known for its light weight. The representative product, portable twin-wheeled electric self-balancing unicycle weigh around 10 kg. Even the heaviest two-wheeled electric scooter weighs only 22.4 kg. The weight is absolutely bearable for an adult. FOSJOAS products could be parked easily. It doesn't occupy too much space. The battery duration could compare that of an electromobile. Once fully charged, FOSJOAS V9 could run for 65 km theoretically. But in reality, riders should take their weight and road conditions into consideration.